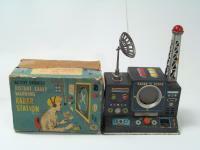 Japanese manufacturer of tin-plate and mechanical toys. 1950's MODERN TOYS JAPAN TIN FRICTION FORK LIFT NO.200 YELLOW ESTATE FIND! 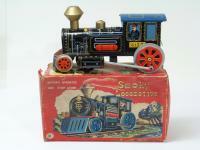 3293 Western Special Locomotive Battery Operated Modern Toys Japan In The Box. Vintage Tinplate POLICE CAR, Made in Japan, 4".